MEATH secured two valuable points in this year’s ultra-competitive Division 2 today, beating Armagh by 2-13 to 0-13 after surviving a second half comeback from Kieran McGeeney’s men. Having drawn their opening two matches, Armagh now face a battle this spring to avoid being sucked to a fight to avoid immediate relegation back to the third rung of League football. This was a game where the wind was the game’s most influential factor. Meath played with it in the first half and worked up a nine point lead. Armagh followed suit and at one stage in the second, trailed by just a point. Without the suspended Jamie Clarke, Armagh lacked any creative attacking spark. Mostly, they spent that first half hemmed into their own ’65. 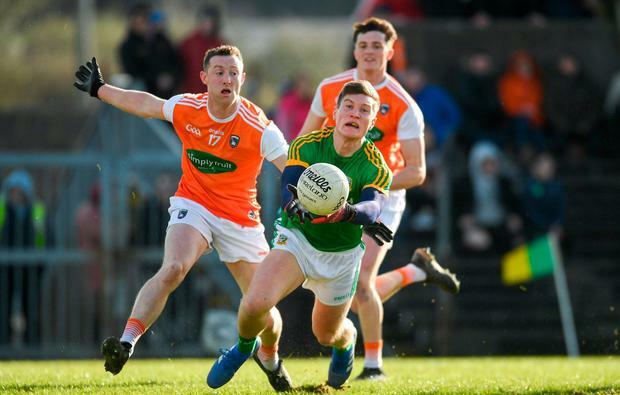 Meath pressed high up the pitch and Armagh spent so much energy and committed so many bodies to working their way out of their half, they scarcely had any of either in the other end of the pitch to do anything constructive with the ball. Donal Keogan was superb for Meath as both a sweeper and playmaker while Skryne half-forward Darragh Campion added to to swelling reputation with two points and a productive 35 minutes. Always in that period, Meath looked to run at goal and they got their reward in the 20th minute when Thomas O’Reilly went through but was fouled as the squared a pass. Mickey Newman buried the penalty and Meath stretched clear. Their 1-9 to 0-3 half-time lead didn’t remotely flatter the home side but given the strength of the wind, neither it guarantee them anything. The teams swapped roles in the second half. Where Meath’s tackling was crisp and clinical in the first half, suddenly it was panicked and sloppy. Within 12 minutes of the restart, Armagh had the deficit shaved to just three points. Meath meanwhile, didn’t have so much as a shot at the posts as they suffered an identical affliction to that of Armagh in the previous half. Stephen Sheridan and Niall Grimley attacked every one of Andrew Colgan’s kick-outs and Meath met dead ends on almost every avenue they went down. Armagh’s press was zealous and well-organised, meaning even the simplest of close-range, pressure-relieving passes between Meath players were executed under extreme pressure. With ten minutes to play, Meath led by just a point and Armagh’s ascent into the lead seemed an inevitability. But Meath found some zip just as Armagh’s exertions began to tell in their legs. Newman kicked two frees, the second after a brilliant surge from Keogan. That forced Armagh to commit everyone to attack leaving a gap that Meath exposed in injury-time. A skewed shot from Graham Reilly fell short for substitute Ethan Devine. He squared for Newman, whose palmed effort was blocked but Devine followed his pass in and finished to the net to secure two valuable points for the Royals. SCORERS – Meath: M Newman 1-5 (1-0 pen, 5f), E Devine 1-0, D Campion, T O’Reilly 0-2 each, J McEntee, S McEntee, B Brennan (f), C O’Sullivan 0-1 each. Armagh: R O’Neill 0-5 (4f), R Grugan 0-4 (2f), S Campbell 0-2, S Sheridan, R McShane 0-1 each.